The story of tensions between a Cincinnati United Way and the leaders of its area’s Black community has unfolded over the past few months. In November, we saw the resignation of that United Way’s first African American CEO, Michael Johnson, and some of the fallout that followed. But the story hardly ended there. According to the Urban League’s State of Black Cincinnati report, the economic situation of African Americans and people living in poverty is alarming. Why is home ownership only 33 percent for African Americans? Why do African Americans earn 58 percent less in wages than other Cincinnatians? The challenge also extends to white Cincinnatians as well. More than 43 percent of whites live below the federal poverty line and there are significant wage gaps between men and women. What are the root causes of these problems and what can be done to change it? More importantly, who can change it? And, if there is a silver lining to the current upheaval at Cincinnati’s United Way, it is that the cultural challenge continues, as WCPO Cincinnati reports. Apparently, the United Way of Greater Cincinnati is under contract with the city to manage the process of distributing city funds to nonprofit organizations to provide human services. The United Way receives the applications and manages the committee that makes the recommendations about how the city funds should be distributed. 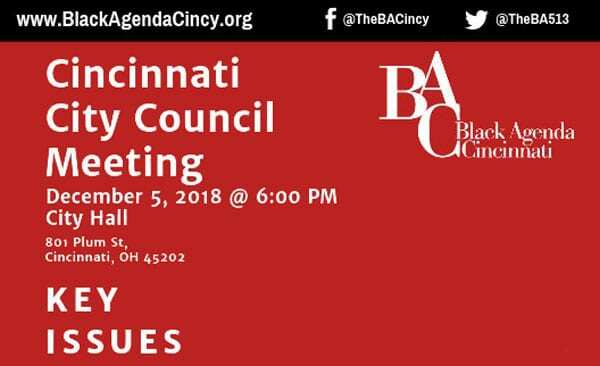 Black Agenda Cincinnati (BAC) has now called for the city to vote to cancel that contract after this round of funding. City Councilperson David S. Mann has said he is reluctant to support that proposal. The city’s relationship with the United Way was established so that city distribution of funds would occur at arm’s-length, hopefully avoiding a situation of individual city councilors angling for funds to go to favored nonprofits. Originally, in legislation passed when Mann served as mayor, the city was to allocate 1.5 percent of its general fund revenue toward human services. It has not been able to live up to that in recent years, but it did allocate as much as $5.5 million in fiscal year 2016. For its part, the United Way is not fighting this too hard. They receive about $90,000 to manage the process—which, according to one person at the organization, does not cover their entire expenses. As all of this is going on, it should be noted that the United Way is now being led on an interim basis by a white man. The board of directors is very large, and the website does not list officers other than the treasurer. The president who was in place when Johnson resigned has herself stepped down. The executive committee of the board comprises 12 people, only two of whom are people of color.